If Munch needed inspiration he could find it alongside me in this hotel! Adjusting to local conditions is something I always accept as an important necessity when working outside of my own country and culture. Most experiences can be regarded as learning opportunities and with a little forethought and a positive attitude they are usually taken in my stride. Indeed it is often those events or conditions that are far removed from those familiar at home that add to the experience of working in previously unknown places. I recall working in Turku in Finland with a good Finnish colleague when the temperature was minus 26 degrees. Walking less than a mile through the city to the venue where we were going to teach, my beard froze solid, forming icicles that hung down towards my chest, and my eyebrows were so stiff with rime that I could hardly move the muscles in my face. However, I also remember that the air was clear, the voices of children singing in the cathedral were very moving and the company excellent. In China I have on occasions found that the challenges are of a dietary kind. Though I became quite adept at using chopsticks whilst working in Hong Kong, the wide ranging foodstuff that I am more used to seeing hopping around ponds, slithering through the long grass or climbing trees was not always to my taste in mainland China. Having been told that the noxious smelling fermented tofu, considered a delicacy by some, tasted better than it looked, I found that I had been unintentionally deceived. It may well have been a local speciality, but it most certainly was not to my taste. Despite this, I was able to laugh about this situation with Chinese friends, and enjoyed seeing city sights that were novel and interesting to my western eyes. Here in India, having visited so many times, I have begun to feel inured to the crazy traffic, the obstacle course that appears where pavements should be, the late starts of meetings, and the mangy dogs that roam the streets. You know that you are comfortable in India when you find youself dozing off in the back of an autorickshaw. I love the variety within Indian food, and have learned to cope with all but the hottest days in Chennai. However, just when I began to think that I was fully acclimatised, my complacency found me out. Power cuts, often associated with stormy weather are a not an unusual feature in India, and these are usually short in duration and manageable. Today, a series of such “outages” as some call them here, have been the order of the day, causing regular minor interruptions to sessions on the MA course. These are generally manageable, and of course, our excellent students are very tolerant. 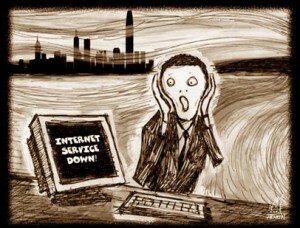 Whilst this is a small inconvenience, other issues since my arrival in the city have been much more of an irritation. It is a symptom of modern life, and more especially today’s working practices that we struggle when we have no internet access. Our lives are, in part, governed by emails, which everyone assumes provide a quick and easy form of communication between all parts of the globe. When such a facility is not available, which has been the case for most of the time when we are in our hotel after a day’s teaching, and hoping to catch up with work from home, it is possible to quickly become irascible. Before I go any further, and begin to sound as if I am moaning, let me state that the hotel staff are all very pleasant people, and I am sure that they are doing their best to provide a service. We have internet access at the teaching venue, so we can, to some extent work around the lack of this facility at the hotel. Such a minor inconvenience I would normally take in my stride. But when this is coupled with the fact that my laundry has gone walkabout somewhere in the suburbs of Bangalore, I begin to feel the strain. It is said that Mahatma Gandhi when he was so brutally assassinated owned two dhotis a shawl and a pair of sandals. This was more than adequate for his needs. This I say is all very well, but I am not a Mahatma, and whilst I am generally of a calm disposition, I do not have Gandhiji’s saintly characteristics, and my tolerance level is far less than his! I have no doubt that before too long I will be laughing about what are, after all, a minor series of inconveniences. I know that this is far from my usual experience of staying here in this city, where people are always welcoming and eager to ensure every comfort. Above all, the pleasure gained from working with good colleagues and excellent students means that as always, being in Bangalore is a privilege and a positive experience. The teaching has been a pleasure, and the interaction with people, not only on the course, but during my morning walks around Jayanagar has been, as always, a delight. Do I feel better for that – probably. But I’d still like to become reacquainted with my laundry! 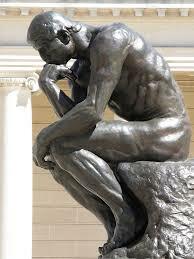 If my laundry doesn’t arrive sooon I shall be as naked as Rodin’s thinker. Then they’ll be sorry! As I am reading more about handwriting,I see it as a skill which we need through out our lives,to express,communicate and so true it is very much needed to ” get things off from one’s chest”….haha!!! I am still trying hard to write..but I have started to write my thoughts on daily basis.I may not be a good writer,but the whole process of putting things down,is such a pleasure…And to be very honest,that is one of the take aways for me from this MASEN program.Thank you Richard! Keep at it. You will find it becomes easier and your writing improves. You have already demonstrated that you can write throughout the course. I am sure that you will be a very good writer. Good news by the way – just as I posted this blog my laundry arrived! A real cause for celebration!! I love to write but I don’t write regularly. I used to till a few years back. I think I should start writing again. Thank you for putting the thought in my head…..
Do write something. You have a lively imagination and a thoughtful nature. I am sure you can put some great ideas into words.